Making our children’s rooms happy and safe places to be is high on the list for many parents. This makes window shutters a very strong choice to consider when choosing window treatments for our little angels bedrooms. If you are keen to design the perfect pink palace or the best blue bedroom, Cheap Shutters can make the ideal solution for your dreams. We also help with the dreams of your little ones of course! Babies start seeing colour at around two months. This develops for a further six or seven months according to Baby Centre Bright and primary colours are often the choice for infants. When they get a little older, more subtle or soft palettes are often chosen for their bedrooms. With shutters you can choose from a huge range of wooden stained and custom painted colours. Bespoke hand painted colours are also available for a small surcharge giving you the option of matching their current must-have decoration. read more about our shutter colours here. Windows can take up a lot of room in a childs bedroom, so why not extend your theme or defining colours onto the windows! We all want to protect our children. With shutters you have a solid wooden window covering which stays securely against a wall or window. This means there’s less chance of getting tangled in flapping curtains and less chance of strings being caught up in their everyday playing. Of course you will also see a benefit of less clutter in their rooms. No matter how often you tidy a childs bedroom, it’s only a matter of time before it is converted into a chaotic tip once again! 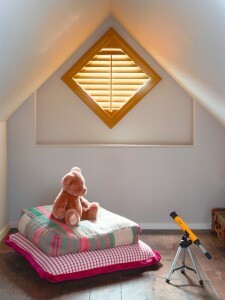 With window shutters there will always be one aspect of the bedroom in order. We promise! Once you have got a quote and invite our consultant to visit you and show off our products, why not ask your baby or children to help choose their window shutters! Part of happy development is including our children in choices. We know they don’t always make the best ones, but having them be part of the process gives a sense of freedom and independence which children crave. The great news is that interior shutters may be more affordable than you think!